An updated design makes Hario's new Mini Mill better than ever! Starting with a scratch resistant smoky gray case and catch jar, the new Mini Mill brings a cleaner, updated design over the original's black and clear casing. A reinforced hex nut at the handle offers a sturdier grip less likely to strip out than the original, too. The same ceramic conical burr and stepped grind adjustment remain, offering a great introductory grind for brew methods from French Press to Aeropress. Conical Ceramic Burrs - Ceramic burrs stay sharp longer than steel, and a drop-through conical shape ensures low retention after grinding. Travel-sized - The diminutive Mini Mill packs easily for travel with a small catch bin and removable hand crank. Stepped Grind Adjust - Adjust your grind setting with a couple of clicks on the burr-mounted grind adjust. Tool-free Disassembly - Removing the bottom burr is easy, and the rest of the grinder comes apart by hand. Reinforced Handle Connector - A reinforced hexagonal connector at the handle is less likely to strip compared to earlier models. Better Looking - The smoky gray colorway is much more attractive than the classic black and clear look. Less Likely to Strip - The reinforced handle washer feels like it will definitely hold up better than older models. 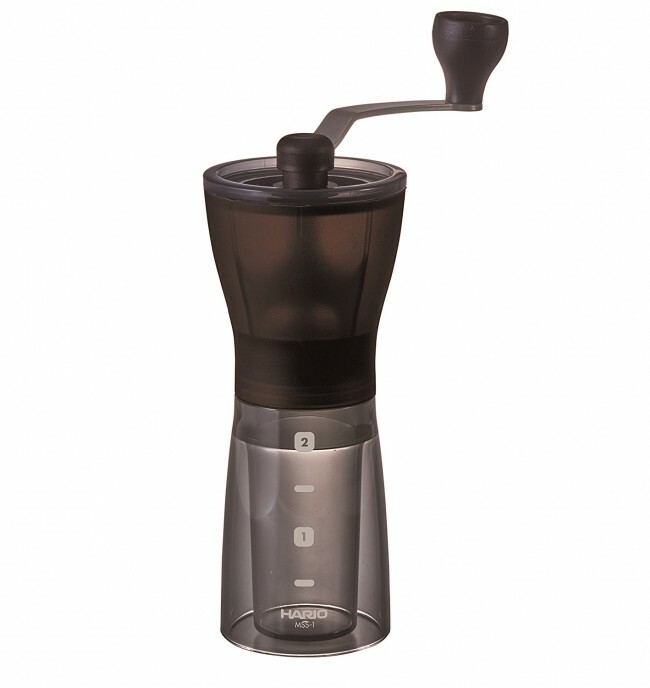 Entry Level Grinder - For someone interested in brewing better coffee on a budget, there are few grinder at this price point so capable. Stepped Grind Adjust - The clicky grind adjust is firm on our test model, but the jury is still out on whether it will start to wander after being worn down like the original Mini Mill. Of Coarse Not - You lose some consistency the coarser you grind. French Press brewers will notice some fines in-cup. Remove lower burr and sweep out any residual coffee grounds.